The workshop was interesting. Joining in remotely allowed me to learn from colleagues with whom I would never collaborate. It allowed me to share a Toronto case (York’s collaboration on the Heat Registry) of policy influence and what we learned from that case: start small; work with trusted and connected advocates; measure influence over time; seek a combination of qualitative and quantitative metrics; be open to serendipity. The figures in this blog were drawn based on one breakout group I attended by skype. 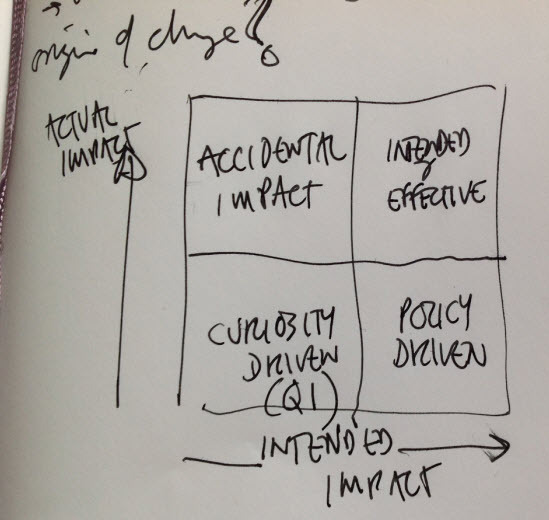 The first is a framework for research and the potential for impact. 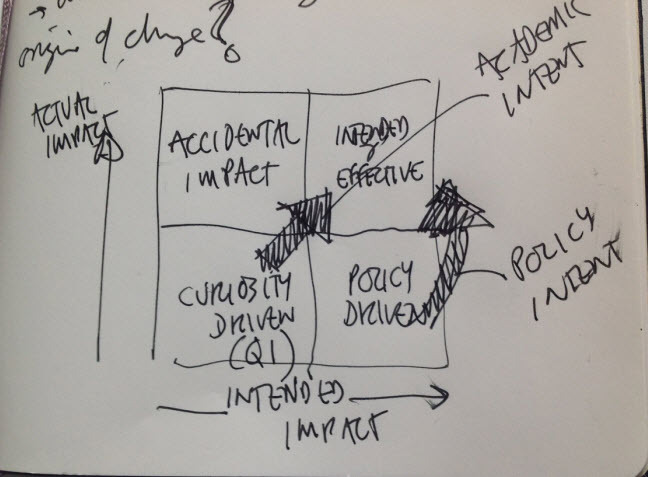 The arrows in the second figure are knowledge mobilization moving research towards intentional impact. On September 25 knowledge intermediaries from UK, Zimbabwe, Argentina, Sri Lanka, Kenya and Canada came together to discuss the impact of research on policy. I am not certain we discovered anything earth shattering or revolutionary but coming together allowed us to synthesize across different experiences. I have blogged before about common knowledge intermediary themes emerging from diverse contexts. This is another instance of convergent evolution where knowledge intermediaries from around the world are asking the same questions, facing the same challenges but also finding commonality in approach. While our work is context specific, being aware of context is universal. The workshop was also the launch of Research to Action, a new website “catering to the strategic and practical needs of people trying to improve the uptake of development research”. And speaking of the uptake of development research, some African universities are now seeking to apply their own research to benefit local communities by acting as knowledge intermediaries. Development Research Uptake in Sub Saharan Africa (DRUSSA) “provides direct support to universities at individual, institutional and systems levels to improve participation in and impact on policy and practice”. They are at the start of a five year program designed to build capacity for the management of research uptake (i.e. the application of research) in 24 universities. I have the pleasure of serving as a Leader and Champion for the DRUSSA network. I have the pleasure of working with the ResearchImpact-RéseauImpactRecherche network of 6 Canadian universities who have invested in an institutional capacity to support knowledge mobilization. Six universities in Canada. Twenty-four universities in Africa. All of whom are developing a capacity to support research uptake and knowledge mobilization. Read the DFID release for more information about the launch of Research To Action as well as the Research To Action blog. Bienvenu, Michel. Terminology is sometimes contentious (see the twitter debate yesterday by searching the @researchimpact stream for a debate about “mobilization”). I am glad that knowledge intermediary is a term that resonates with you. Great piece, David. I wanted to join the workshop from Cape Town but was, in fact, in one of the excellent DRUSSA postgraduate short courses at the time. Presented quite a dilemma. And I share your impression of “convergent evolution”. Come across it all the time. This is a concept whose time has come. Thanks for the post. Linda, I am glad you enjoyed the post and regret not being able to share the electronic stage with you at the workshop. Looking forward to another opportunity in the future!